For the customers of Jamestown Gas & Water, they can now take pride in knowing that their water ‘reigns’ supreme in Tennessee in 2018 as it was recently named the state’s best tasting water in a statewide competition conducted by the Tennessee Association of Utility Districts (TAUD). The City of Jamestown recently won the Best Tasting Water Contest at the TAUD Business Utility Conference held in Gatlinburg, TN on August 9th. Jamestown will represent Tennessee at the Great American Water Taste Test in Washington D.C. where they will be competing for the distinction of Best Tasting Water in the United States. Pictured above from left, Jamestown Water Plant Supervisor Chris Ramsey, Jamestown Mayor Darlene Monday Davis, Jamestown Public Works Director Steve McCoy, TAUD Board President Drexel Heidel, and Jamestown City Recorder Gail Dishmon. Thursday, August 9th, the City of Jamestown won the Tennessee Association of Utility Districts (TAUD) competition for the best tasting water in the entire State of Tennessee. In February of this year, Jamestown won the regional competition for Region Four, which consists of Clay, Cumberland, DeKalb, Fentress, Jackson, Macon, Overton, Pickett, Putnam, Roane, Smith, Trousdale, Warren, and White counties, and won the right to advance to the State competition held in Gatlinburg. 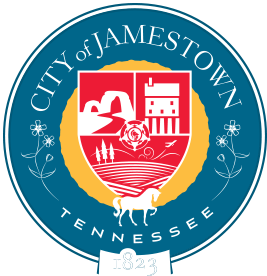 Out of the eleven district winners across Tennessee, Jamestown was selected as number one, its water being deemed superior in taste, clarity, and bouquet (smell). In addition to Jamestown Gas & Water, the other regional finalists competing were Greeneville Water Commission, West Knox Utility District, Luttrell-Blaine-Corryton Utility District, West Wilson Utility District, Fayetteville Public Utilities, Hohenwald Utilities, Dyer Public Works, Vanleer Waterworks, Big Creek Utility District, and Oakland Water System. Judges for the annual competition were Jim Tracy, Tennessee Director for Rural Development; Claudette Atwood, Chief Financial Officer for the National Rural Water Association; John Greer, Utility Specialist for the State of Tennessee’s Comptroller’s Office; and Brittany Crocker, Knoxville News-Sentinel. As the winner of this contest, Jamestown will be representing Tennessee on the national level in the Great American Water Taste Test conducted as part of the National Rural Water Association’s Rural Water Rally in Washington D.C. in February of 2019.